The brilliant waters of Bottle Creek Lagoon. The two largest islands in the country, North and Middle Caicos offer extensive and beautiful wetlands to explore. We do recommend doing your research and planning if you expect to venture far into the wild as the mangroves can be difficult to navigate in areas. There are many rewarding and remote spots to discover. See our overview article on kayaking for additional information. Exploring the channels of the Bay Cays and Bottle Creek. The islands of North and Middle Caicos are the two largest in the country, and combined comprise over half the land-mass. 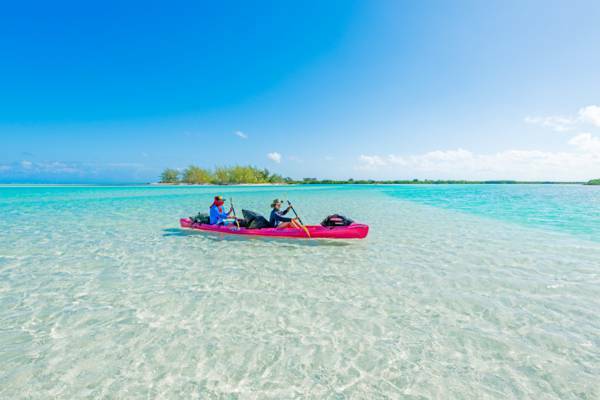 The extensive wetlands and shallows found on their southern coasts make for some of the the best kayaking in the Turks and Caicos. 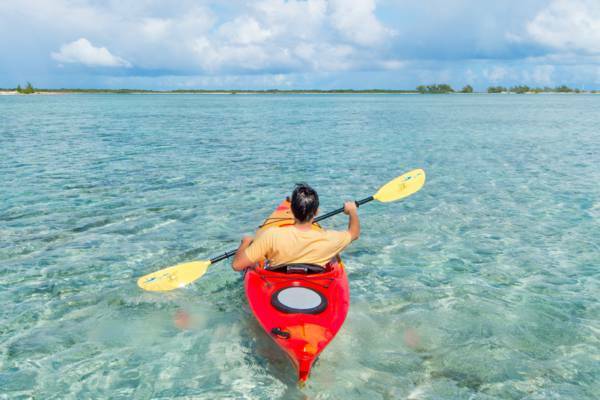 Kayaking on North and Middle Caicos can generally be split into two categories: casual trips of less than a few hours long, and more strenuous half and full day and overnight expeditions. Many villas on North and Middle Caicos include complimentary kayak use. Although great for casual short distance cruising off the coast, the location and type (villa kayaks are usually sit on top ocean kayaks, easy to use but not as efficient for long distance as sit-in cruising kayaks) are not as suitable for exploring. For longer kayak expeditions, the islands offer several excellent exploring and camping routes. Excursions of this type require a bit of planning. Although there really aren’t many actual dangers and navigation is generally easy around North and Middle Caicos, we recommend carefully planning your routes and possibly talking with a local tour operator before you depart. Due to the remote starting points, most long distance routes require kayak transport to the launching location. See locations below for more information. One of the beautiful wetlands on North Caicos. The extensive and spectacularly turquoise Bottle Creek Lagoon is the most popular paddling spot. This shallow sound and wetland protected area include the south sides of Bay Cay and East Bay Cay. If you make it all of the way to these uninhabited islands, expect beautiful and wild beaches. 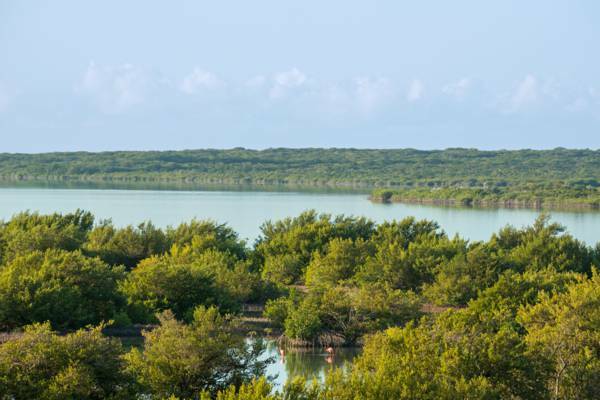 The western mangrove wetlands of North Caicos are a decent location for boat launching kayaks from Providenciales. Due to being on the leeward side of the island, the wetland and channels tend to be a bit more sheltered that other locations. Small sharks, turtles, conch and bird abound. Found on the remote east end of Middle Caicos, Lorimers Creek offers excellent overnight and exploring potential for the serious kayaker. Joe Grant Cay, Dickish Cay and the old cotton plantations of Lorimer’s Peninsula await. Kayaking is generally an easy and safe water sport. However, there are several things you be aware of. The most common problem paddlers’ encounter is having a difficult return journey due to the wind, currents and tides. Before you get well underway, pay attention to your drift direction and speed. If you head into the drift, your return trip won’t be tiring. Currents tend to be less of issue than the wind, but can be a bit more forceful at the channels between cays. Don’t get dehydrated. We advise taking about one gallon per person for the 2 to 4 hour paddle. You probably won’t need that much, but it’s simply a good idea to have it. Some of the wetlands on North Caicos and Middle Caicos are extensive. The channels into these mangrove networks are maze-like and tend to look the same after a few minutes, so either go with an experienced guide or do your homework and bring (and know how to use!) a GPS unit or maps. Wear a life vest or personal floatation device. The weather can quickly change and accidents happen. 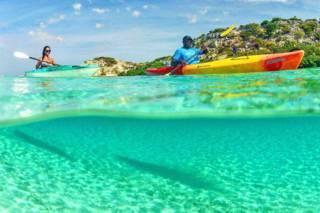 Big Blue offers the perfect kayaking adventure for both those staying on North Caicos and Providenciales. Explore Bottle Creek, the Bay Cays, the south side mangroves and more. Both North and Middle Caicos have extensive wetlands to discover.